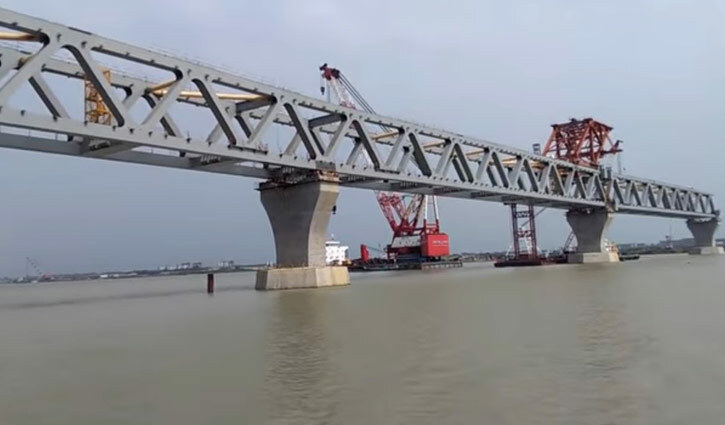 Secretariat Correspondent: The ninth span of the 6.15- kilometre long Padma Bridge will not be installed on 34th and 35th pillar at Jajira end in Shariatpur district today (Thursday) due to technical reason. Sub Assistant Engineer of Bridge Department Md Humayun Kabir confirmed the matter. Earlier, Project Director of Padma Multipurpose Bridge M Shafiqul Islam said “If everything goes well, the 150-meter long ninth span would be installed on two pillars at Janjira point at 11:00am Thursday”. A total of 41 spans will be installed on 42 concrete pillars to complete the bridge. The overall progress of Padma Bridge reached to over 63 percent while over 73 per cent work of the main bridge has been done so far. The first span of the Padma Bridge was installed on September 30, 2017.